Our 40 years of experience are your advantage over the competition. While they are working with their supplier to build two-shot molds, you will be getting all the answers that will steer your project to a successful launch. We sample and run parts on all of our molds before they leave our shop, so your launch is as smooth as possible. If you need guaranteed success in your upcoming two-shot part program, you need Master Precision Mold Technology on your team. Please call for a feasibility study on your project. 1. 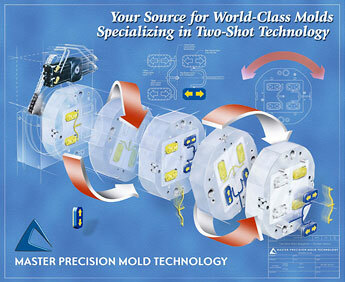 In-mold assembly—by the consolidation of several parts into one molded part, the need for costly secondary assembly is removed. 2. The durability of graphics—while painted or printed graphics wear quickly, two-shot graphics are virtually indelible— as permanent as the part itself. 3. Improved customer appeal—Soft-touch grips (the largest growth sector of two-shot molding) improves the perceived quality of any product. 1. Part Design — MPMT can save you money on the project when consulted early in part design. 2. Material Selection — If the two materials need to chemically bond, they must be carefully selected. 3. Production Method — The first show part must get into position before the second-shot material is injection molded over it. 4. The Mold Supplier — Molding two parts simultaneously and making them fit perfectly together is an insurmountable task for most mold shops.